Everybody is encouraged to reduce the amount of carbon dioxide (CO2), and other greenhouse gases (GHGs), that they release into the atmosphere as a result of their activities, especially from using fossil fuels. We can use low-energy lightbulbs and drive fuel-efficient or electric cars. Even when we try our best to reduce our carbon footprint, there are some activities that generate GHGs and that are very difficult to avoid or reduce. Flying in airplanes is an example. When we cannot avoid more GHG emissions, we can pay someone else to reduce their carbon emissions to compensate for our emissions. This is called carbon offsetting. An example is when we fly a long distance and pay a fee for some organization to plant trees that will absorb CO2 or other GHGs in an amount equal to the GHGs generated by our share of our flight. Airlines often provide an easy means for us to simply check a box to pay a fee calculated to represent GHGs equivalent to our share of our flight. Sometimes a better offsetting project is one that promotes clean-energy projects, such as distributing efficient cooking stoves to poor communities, where the offset directly reduces use of fossil fuels (and can improve the health of the affected community). There are problems with offsetting projects. It is critical that those buying offsets can be assured that the project, e.g., planting trees, would not have happened without the offset payment. If the trees were to be planted anyway, then the payment has not really reduced carbons but only enriched the planter for something they were going to do any way. This is called the need to assure “additionality,” or requiring the offset to have an effect on the amount of carbon in the atmosphere. 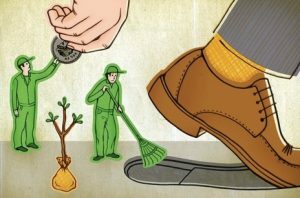 To assure those who want to buy carbon offsets that the system is doing what it is supposed to do, there are organizations, such as Climate Action Reserve, Green-e Climate and Gold Standard, that investigate and certify the offset projects. Identify an activity which you cannot avoid and which generates CO2 or other GHGs, and find several carbon offset projects through which you can purchase offsets. Then determine whether the carbon offset projects are reliable and legitimate. Then decide which of these carbon offset projects works best for you. Then buy a carbon offset.